Becoming a star was not always O’Brian’s ambition; he almost became a lawyer. Born April 19, 1925 in Rochester, New York (as Hugh C. Krampe). After a semester at the Univrsity of Cincinnati with studies charted toward a law career, O’ Brian enlisted in the Marine Corps at age 17. He became the youngest drill instructor in the Corps’ history, and during his four year service won a coveted Fleet appointment to The Naval Academy. After passing the entrance exams, he declined the appointment, intending to enroll at Yale to study law. After receiving honorable discharge from the Marine Corps, O’Brian went to Los Angeles where he planned to earn money for his Yale tuition. There he met Hollywood movie stars Ruth Roman and Linda Christian, who introduced him to a little theater group. About a year later, Ida Lupino saw one of his performances and signed him to play his first starring role in the film “Young Lovers,” which Lupino directed. This bought him a contract with Universal Studios. During his first year under contract, he enrolled at Los Angeles City College and managed to amass 17 college credits in addition to making five pictures at Universal. 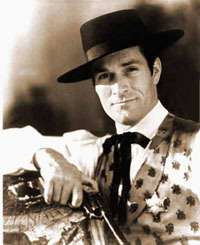 After retirement from acting, O’Brian lived in a hilltop home overlooking Beverly Hills. In June 2006, he was married for the first time to longtime partner Virginia Barber. 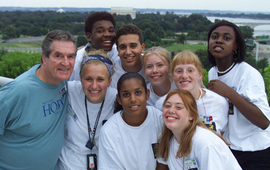 O’Brian continued his humanitarian and public service work both with HOBY and as national chairman of the Spirit of 45 campaign. Spirit of 45 is a nonpartisan, non-profit initiative to raise public awareness about the 65th anniversary of the end of World War II and to honor the legacy of America’s Greatest Generation. It seeks to engage young and old in a shared intergenerational project that will preserve forever an important part of our nation’s history and heritage, while reinvigorating a deeper awareness and appreciation of coming together as a community, honoring service to others, and restoring a sense of national unity at a time when America, and the world, are again facing historic challenges. Hugh O’Brian passed away the morning of Monday, September 5, 2016. He died peacefully in his sleep with his wife and long-time partner, Virginia O’Brian, by his side. He lived an active and full life throughout his 91 years, particularly in relationship to HOBY.